It’s baseball season! 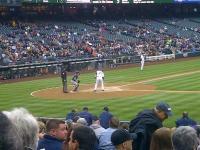 Perfect time to go see Seattle’s famous baseball team playing at Safeco Field. It’s also a great occasion to get a taste of Seattle’s spirit, as the Seattle Mariners play a big part of the Emerald City cultural landscape. Based on our own experience, here are some of the things you might want to consider before game day. Zero stress and maximum fun guaranteed! Nothing is easier than to get to Safeco stadium from our Visitor Center! Just head straight down the hill on 176th St. to the SeaTac/Airport Station and jumped in the first Light Rail to downtown Seattle. The Central Link Light Rail is by far one of the most convenient and effortless ways to get to Safeco Field. It is not only convenient, but it is also pretty cheap ($5.50 round trip) when compared to the price for parking by the stadium. Plus, you get to experience the pre-game mood as you will probably encounter many other fans heading to the game. From SeaTac, it will take you only about a half hour to get to stadium stop right by Safeco Field. Allow yourself some time before the game to stop by the Mariner’s gift shop or simply get appetizers at one of the various bars and restaurants on the streets (Occidental Ave/1ST Ave) adjacent to the Stadium. Whether you’re planning to get a drink or some tasty food, the Pyramid Alehouse is among the local’s favorite place to pre-game. Ideally located just across the street from the stadium on 1st Ave S, its lively and entertaining atmosphere will warm you up for the beginning of the game. Let yourself be seduced by their delicious smoked salmon burger or their savory chorizo dip and don’t forget to taste one of their hand-crafted beers such as the Draught Pale Ale! Once at the stadium, you’ll find plenty of fan shops as well as all different kinds of drinks and snacks including nachos, peanuts or also more local delicacies like chocolate covered berries. The stadium even has several bars so you can enjoy watching the game from one of their patios. And if you arrive a little early at the stadium, you should be able to get close and see the players training on the field before the game. Luckily, we went to a Mariners game on a very nice day and had the Stadium open roof allowing us to see a breathtaking sunset on the Puget Sound. It was totally worth the experience! After the game, we headed back to the Stadium Light Rail station on 501 S. Royal Brougham Way along with many other Mariners’ fans. You don’t have to worry about avoiding traffic or getting out of the parking lot and on top of this, you get to enjoy a very pretty view of Seattle skyline as you are leaving the city. The Central Link Light Rail runs every 10-15 minutes until midnight. Visiting Seattle when the home team is away? Take a Safeco Field tour to learn more about team and the explore the ballpark.